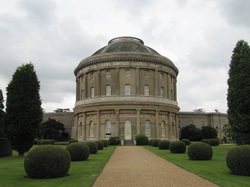 Ickworth estate is in Horringer, just outside of Bury St Edmunds and is owned and maintained by The National Trust. It has a house and gardens which are open to visitors most of the year. If you are not a member this is quite a pricey choice for a walk, but it is well worth a visit. There is a huge area of parkland, some wooded, some in open fields, a lake, a river, a walled garden and of course the rather striking house itself. The inside of the house is not open all of the time but the grounds seem to be open all the time. The cafe has recently changed hands to become a National Trust run one and is not quite as gluten-free friendly. They have got a list of allergens available for viewing, but there is not much choice. They do, however stock gluten free rolls, and some of the soup is ok. It is always very busy there though so I would recommend bringing a picnic or using the outdoor cafe. The toilet facilities are not the best. You have to get through the shop and down the stairs or the lift to the basement to get to them. The baby changing room is pretty small and is just a changing room, not a loo. I couldn’t get the buggy in with us. However, the disabled loo is right next door, which has plenty of room. There are other toilets outside near the car park, which are brand new and fantastic. In the summer there is now an outdoor kiosk with a lovely seating area under the trees. They serve teas and coffees, ice creams, jacket potatoes, sandwiches and cakes. There are no high chairs here but plenty of space if you have a buggy or a dog. The variety of walks means you could go every day and not repeat the same route all week. Some routes are much more difficult to navigate with a buggy, but for the most part there are good paths which are clearly signposted. There is a fantastic playground with enough for both little toddlers and larger children to be entertained for ages. It is mostly wooden with an obstacle course and zip line as well as a few tree trunks for exploring. There are also a variety of swings and slides to choose from. If you come in the spring time, you will see hundreds of lambs all around in the fields. The lake is also home to a variety of ducks, geese, swans and other birds, including kingfishers. There is another smaller pond within the woods which often has ducks and moorhens nesting on. The snowdrops and daffodils are glorious in season and in the winter, Ickworth is stunning in the snow.